Do you have the ability to champion values, culture, and people initiatives to enable our employees to be the best they can be? Then work with us on our mission to ensure fairness in the civil justice system for the most vulnerable members of our community. From Silicon Valley to Napa Valley, we help clients protect their livelihoods, their health, and their families. Our clients include the working poor, families with children, foster youth, seniors, immigrants, veterans, and persons with disabilities. Through our regional county offices, our mobile advocacy clinics, and our nationally-recognized Legal Advice Line, BayLegal prevents domestic violence and sexual assault. Bay Area Legal Aid’s (BayLegal) mission is to provide high quality legal assistance regardless of a client’s location, language, or disability. 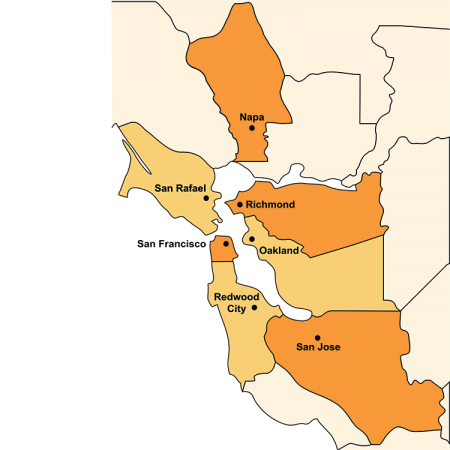 BayLegal is the largest provider of free civil legal services to low-income residents of the San Francisco Bay Area, with six regional offices serving seven counties: Alameda, Contra Costa, Marin, Napa, San Francisco, San Mateo, and Santa Clara. BayLegal’s approximately 150 staff members provide wraparound legal services in housing preservation, domestic violence and sexual assault prevention, economic security, consumer protection, and healthcare access. We seek attorney candidates who are adept working in a litigation-rich practice, will be self-directed, and are comfortable working in a fast-paced environment. This is anticipated to be a six-month position. It is located in our Richmond office and requires regular travel throughout the county. Cultural competency in working with low‐income clients from diverse backgrounds, including clients with physical and mental disabilities, LEP clients, LGBT clients, survivors of trauma. Compensation is based on experience. Position will be eligible for medical and dental benefits. Bay Area Legal Aid thrives on our diversity and we are proud to be an equal opportunity employer. We are committed to building a culturally diverse workplace and strongly encourage women, persons of color, LGBTQ individuals, veterans, persons with disabilities, and persons from other underrepresented groups to apply. Review of applications will begin immediately and continue until the position is filled. Please send cover letter, resume, references, and writing sample to: jobs@baylegal.org Please reference Contra Costa DV Temporary Attorney in your application.